There is nothing’s more uncomfortable than a summer sunburn because people enjoy warm weather to go swimming, fishing, blue skies, picnics with family and friends, and some other outdoor activities. 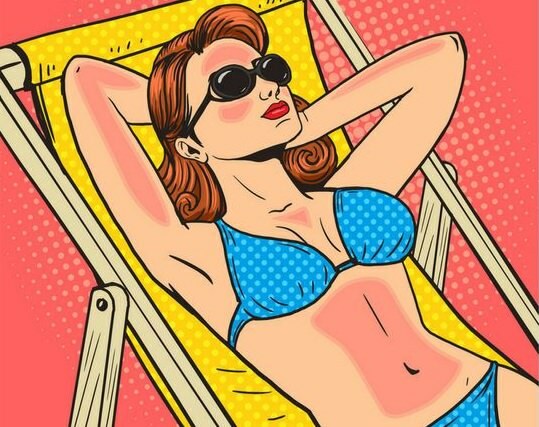 The main reason behind the sunburn is sun’s ultraviolent rays. Too much exposure of sunlight can damage your skin, making it red and discomfort. These symptoms probably not occur immediately; it can take up to 6 to 8 hours to appear sunburn on the skin. If you will not treat it, it will cause peeling or blistering the skin. Prevention is the best way to avoid sunburn. Don’t go outside (except necessary) between 10 AM to 3 PM, when the sun is strongest. If go outside, wear proper dress that covers your skin, also wear hat and sunglasses. Plus, apply an effective sunblock on your visible skin areas, few times a day. Everybody follow these important precautions. However, if you are suffering from sunburn then don’t need to use expensive creams to feel better, you can try some home remedies that can soothe your stinging skin and reduce inflammation. Mix 3 tablespoons of baking soda with enough quantity of water to make a paste. Apply the paste on affected area using the cotton balls. Leave the paste for 10 minutes then wash with lukewarm water. Follow the process one or two times in a day for several days. Alternatively, fill your bath tub with cold water and add 1 cup of baking soda in it. Sit in the tub for 15 minutes, then getting out of the tub and pat dry your skin. Wrap a few ice cubes in a damp cloth and hold it lightly over the affected skin as long as it is cool. Follow this process several times in a day to relieve discomfort. Don’t apply ice directly on your skin because it can cause of skin damaged. To use this remedy, you just take one cup of hot water and brew 2 or 3 teabags in it. Soak them for a few minutes, and then remove the teabags and allow the solution to little cool in room temperature but make sure it doesn’t get too cold. Soak a cloth in the tea and dab it over the affected area. Leave it to dry it completely and reapply the process 3 or 4 times. Don’t need to wash it, do this daily for few days. Mix equal parts of cool water and apple cider vinegar in bowl. Soak paper towels in it and place them over your skin until they dry out. Follow the process several times in a day for few days. Alternatively, fill the bath tub with lukewarm water and add one cup of apple cider vinegar in it. Sit in the tub for 20 minutes then getting out of the tub. Do it once in a day. You just extract the gel from an aloe vera leaf, and put the gel in the fridge for 30 minutes. Now apply the chilled gel on the affected skin. Let it dry on its own so that your skin can fully absorb it. Follow the process 3 or 4 times daily for few days. You may need to slightly warm extra-virgin coconut oil in a microwave, apply this oil on the affected area and gently massage it. Follow the process 3 times in a day for several days. Also, check out home remedies for rosacea here at @BeautyEnhancers.